From a galaxy far, far away comes the Mr. 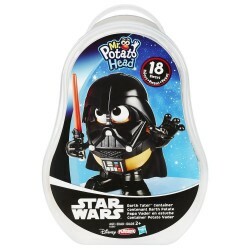 Potato Head Darth Tater Container! This Mr. Potato Head figure turns to the Spud Side as a Darth Tater figure, and he's ready to mash up the Force with 9 character-based costume pieces and 8 fun accessories. 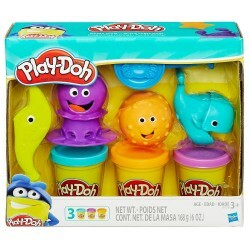 Young Jedi can have out-of-this-world adventures creating wacky combinations, then blast off to the next imaginary galactic mission with the convenient tater-shaped carrying container in tow! Includes 1 potato body, 1 base, 1 mask, 1 helmet, and 14 accessories.